Behind every computer process are miles and miles of code. It is purposefully written to achieve a specific result. What is your code? Do you have a creed to live by? Mother Nature hates a vacuum. Unless we have diligently trained our mind and protected our heart, we are operating on a program designed by another. Rather than being the Captain of our own destiny, we might be on autopilot. Consider this jingle, “If it feels good, …” By rote, we finish the sentence with, “do it.” Why, do we? Grab the controls of your life and let’s examine our codes. On March 3rd, 2010, the state of Wyoming accepted into law a bill declaring The Code of the West the official state code of ethics. 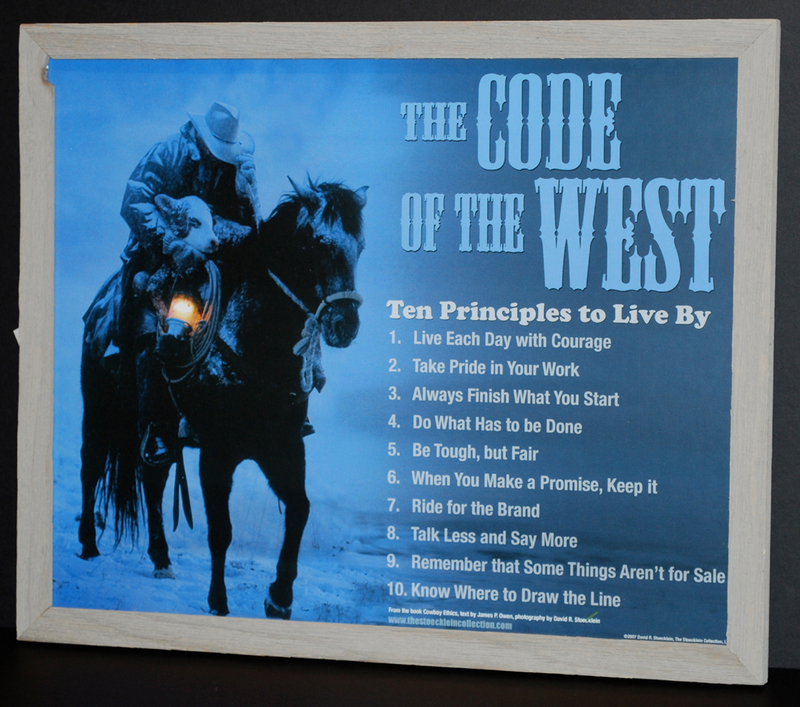 The ten principles come from author James P. Owen and his book Cowboy Ethics. 1. Live each day with courage. 2. Take pride in your work. 3. Always finish what you start. 4. Do what has to be done. 5. Be tough, but fair. 6. When you make a promise, keep it. 7. Ride for the brand. 8. Talk less and say more. 9. Remember that some things aren’t for sale. 10. Know where to draw the line. There is nothing new under the sun. It, even, seems strange to reference the unwritten that was the guiding light for the early pioneers. Yet, these principles were also chronicled by the famous western writer, Zane Grey, in his 1934 novel The Code of the West, and by Ramon Adams, a Western historian, in his 1969 book, The Cowman and His Code of Ethics. The Cowboy Code has been communicated in a variety of ways, by an army of fictional and real life heroes. Knowing what to do — and Doing it — are two very different concepts. Since the hedonistic programming of our society subtly soothes our selfish nature with the mantra of If it feels good, do It, we might not even know what we are doing. A better approach to our growth (and, the growth of others) is possible by understanding, If it is good, do It — with Passion. Speaking of which, let’s consider a simpler way of remembering all of the Code necessary for a life of joy and purpose. One four-letter word contains the foundational elements of good Code — LOVE. Love is patient. Love is kind. Love rejoices with the truth. It always protects, always trusts, always hopes, and always perseveres. Take all of the code — the perfect lists of ten — from the many tough men, and you will find the true abode for peace of mind and purpose of will. It is discovered in a Code of Action.